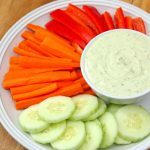 Avocado Ranch Dip with Greek Yogurt paired with fresh vegetables makes the perfect afternoon snack! In large bowl, mash avocado. Add Greek yogurt and Ranch dip mix. Mix together until well combined.